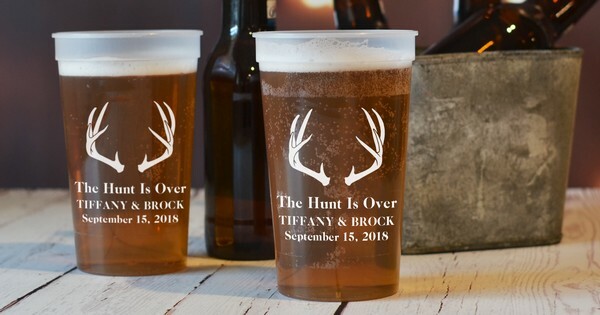 Proclaim 'The Hunt Is Over' at your engagement party, bridal shower, or wedding with decorations, favors, and gifts personalized with deer antler designs and custom print or engraving. Perfect for the bride and groom who are avid hunting fans and may have even met as a result of their love for hunting and the outdoors, deer antler theme decorations like cups, napkins, cake toppers and photo booth backdrops custom printed with the phrase 'The Hunt Is Over, the bride and groom's name and wedding date make useful decorations that will add character to your theme. Deer Antlers designed favors will add interest to your table decorations and provide gifts your guests can take home and use on a daily basis. Groomsmen and bridesmaids gifts featuring deer antlers designs and the name of your wedding party members make memorable gifts everyone will enjoy using for years to come.